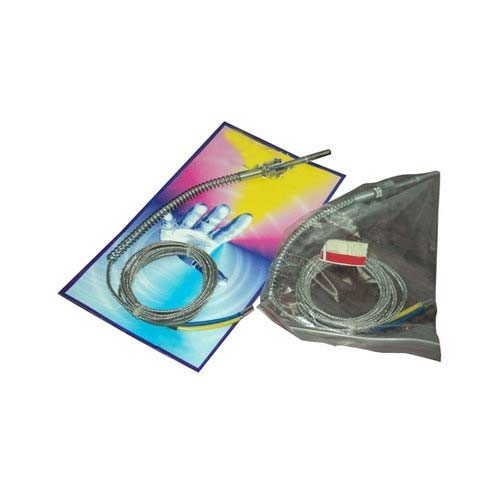 We are a significant organization, engaged in offering an enormous range of Temperature Sensor in numerous specifications as per the needs of our esteemed clients. This sensor is manufactured by our highly skilled professionals utilizing fine grade raw material and progressive technology as per the predefined industry standards. The offered sensor is widely used in various industries to determine the temperature. Our provided sensor is highly praised among our patrons owing to its cost-effectiveness. Since our inception in 1985, "Flexicab Industries" has market its presence in the market as a trustworthy manufacturer and supplier of high grade Thermocouple Extension Lead Wire, PTFE Sleeve, PTFE Wire And Cable, Fibreglass Cable, Temperature Sensor, etc. The wires & cables we offer are manufactured using excellent grade copper, nickel-chromium, iron, rubber and others that are procured from authorized, putative and efficient vendors. The clear focus of using only quality inputs helps us in developing a highly reliable array of products. The high temperature hook-up wires, we offer are highly acknowledged for their soldering iron resistance, excellent electrical properties, chemical resistance, resistance to mechanical abuse, electrical stability and weather resistance. Due to such excellent features, these wires are widely used in different electronic test equipment, communication equipment, electronic equipment for aircraft, radar, computers, etc. We are manufacturing our products under our own brand name Flexiglass Flexflon.